I first saw this shirt at a press day a few weeks ago with Kate. She ended up buying it and the next time I saw her she was wearing it. And of course I had to go get it too. Fits well with my current love for long tops and leggings, and my love of pink. 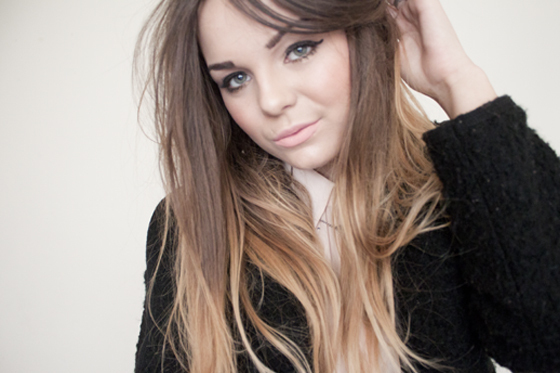 I'm still wearing that amazing River Island Coatigan, Its just too warm and snuggly to not! love the sleeveless shirt and your hair is amazee. This coat looks so snugly! Pretty! I love the shirt. I love this outfit, the detail on the shirt makes it really unique! That's a pretttty sick necklace. I feel like I wear lots of black, too. I saw this on Kate and instantly fell in love, it's beautiful on too and with that incredible coatigan!! I love the Coat/Cardigan. A wardrobe essential it seems. a lovely outfit, but that necklace is amazing!! GAH that top is so nice! It's the perfect length :o That coatigan looks very snuggly too, jelllll. I need this nail colour, it's gorgeous. Love the coat especially! How much did it cost? Can't find it on the website! Love everything here! <3 Especially the triangle necklace and nails! Lovely! And damn, that RI cardigan sure does look super comfy and cozy! Adore the ring! wish it was still available.